Acute lymphoblastic leukemia (ALL) is a heterogeneous group of disorders caused by clonal expansion of immature lymphoid cells. The overall age-adjusted incidence is approximately 1.6 per 100,000 persons, with higher rates among children and adolescents than in adults. Diagnosis is based on bone marrow (BM) morphology, immunophenotyping by flow cytometry and/or immunohistochemistry, and identification of chromosomal/genetic abnormalities by cytogenetic or molecular genetic analysis. Precursor-B ALL, characterized by a malignant proliferation of immature B-lineage lymphoid cells, comprises the majority of all leukemias in both adults and children. Treatment of ALL involves multiple agents given in a complex regimen, typically lasting 2–3 years and involving numerous chemotherapeutic agents with different mechanisms of action. 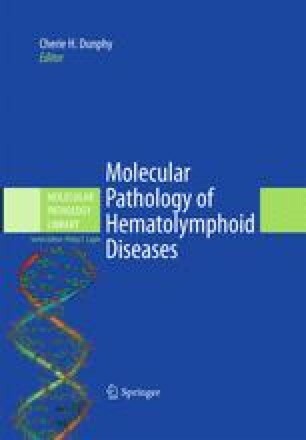 – Patients who achieve clinical remission (<5% blasts in the BM) after an initial month-long induction phase receive intensified consolidation to eliminate residual leukemic blasts, and maintenance therapy to suppress re-emergence of therapy-resistant clones. The author would like to acknowledge the invaluable technical assistance of Dr. Martha Sensel and Kathryn O’Dell in the preparation of this chapter. She would also like to thank Dr. Nyla Heerema for her careful review and suggestions. HUGO Gene Nomenclature Committee. Internet 2008 October 14;Available at: URL: http://www.genenames.org/aboutHGNC.html.